Neck lift surgery can be performed alone or in combination with facelift surgery to rejuvenate, tighten and freshen the shape, angles and position of the neckline. With aging, skin and fat excess may develop in the neck. Vertical muscle bands and vertical or horizontal skin creases develop. Fatty deposits in front of or behind the muscle may droop. All these result in a tired, loose and aged looking neck. Each of these layers needs to be addressed. Skin excess is either taken up or excised and fatty tissue may be repositioned or removed by surgery or liposuction. The separated muscle bands are tightened and repositioned. Dr Kippen will assess each layer in turn and aim to correct each to the required amount. Two consultations are required and photographs are useful for accurate planning. In elastic skin, liposuction will be sufficient to remove the soft and superficial fatty deposits. Because the skin is still elastic it will take up and re-drape to the new contour. Depressions where the chin droops over the jawbone may also be corrected. Skin is excised and the soft tissues double breasted to improve the contour. Soft or weak chins may be augmented through the same incisions. These incisions are hidden below the chin line and heal well. They are usually a few centimeters in length. Bruising and swelling is variable but begins to settle down in one to two weeks. Neck massage helps drain fluid collections or swelling. Scar management is essential to minimise scarring. Drooping salivary glands will be repositioned; at times these may be more prominent or obvious after surgery. 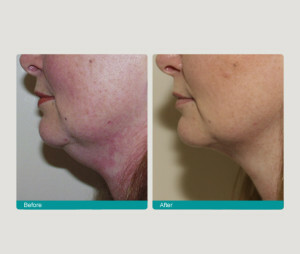 The surgery addresses the excess skin, fat and muscles, and neck contours and angles are re-established.